We are in the business of providing scionwood and acclimatized varieties of apple trees, pear trees, and plum trees. We specialize in antique apples which are propagated at our nursery in Northeastern Wisconsin. We graft apples trees on various semi-dwarf (M26, M7, and M111) and dwarf (Bud9, P2, G41, G214, and G935) rootstocks. We graft pear trees on various semi-dwarf (OHxF87) and dwarf (OHxF333) rootstocks. 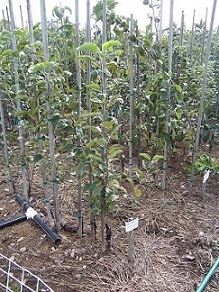 We will also do custom bench grafting of any of our cultivars. Very large, striped red over a greenish background color. Flesh white and semi- firm. Excellent mid-season cooking apple also good for dessert. Medium sized tree comes into bearing young. Medium red apple with crisp sweet flesh. Tree is disease resistant and easy to grow. Good keeper. Sweet to bittersweet cider variety. Very productive tree with some resistance to fire blight. Medium sized, round apple with deep purple skin. Good eating, cooking and cider apple. A bittersweet cider apple. Fruit is small, green/yellow with some russetting. A medium to large apple with yellow/greenish skin with some red stripping. A dessert apple that is good for lots of uses. The white flesh is firm, juicy and very aromatic. Trees are hardy but susceptible to fire blight. Medium, red apple with crisp, tart flesh. Great eating apple and long keeper. A bittersweet cider apple. Fruit is small with yellow skin. Blooms late but very productive tree. Short storage. A McIntosh type apple with better color and flavor and longer keeper. Medium size fruit with a creamy white, crisp, juicy flesh. A medium to large, red apple. A very good keeper that is very disease resistant. Thomas Jeffersons favorite dessert apple; A medium to large; orangish apple with some russeting. The flesh is yellow with spicy, juicy favor. Very good keeper. Can be picked green but will turn an attractive yellow with a blush if allowed to hang on the tree. Uiform fruit size. Keeps up to 6 months in storage. Ripens six weeks before Gibson Golden. Vigorous tree habit but no limb spreading is necessary. An old American cider apple, also good for eating and drying, and attractive for a russet. Tree medium to large, fruit medium to above. The sugary, dense flesh of this apple is the essence of the European reinettes. A medium size green-yellow apple with a tart flavor. Very good keeper and disease resistance. More complex flavor than its offspring Golden Delicious. Spicy, tangy, sweet with light yellow flesh. Best grown in warmer climates. Direct marketers seek out this fruit. Excellent pollinizer.